Bend the knee or be destroyed! How does this work with the Great Kraken? If I attack and win an Unopposed power challenge by 5 or more can I bring in the Great Kraken and the trigger is ability as well (draw a card or take one power). The card was not in play when I won the challenge but does this prevent it from being triggered ? Yes, you can trigger it. The window for winning by x str, or winning uo, is the same one. And it is still open until all players pass on actions. Therefore you can play a reaction to winning by 5, go get the Great Kraken, and trigger a reaction to winning uo. Another way to look at it: Support of the People wasn't "in play" when you won the challenge, either, and nothing prevents you from triggering it. Cards with reaction and/or interrupt abilities do not need to be "in play" when their triggering conditions are created. They only need to be available for the player to trigger while the appropriate window for using reactions or interrupts is open. So another example - you could SotP, -> The Mander -> and draw into Superior claim and chain it all together ?? can you put a second limited card into play using support of the people? I assume the answer is no but I figured I'd ask. You can. Limited only applies to marshaling cards, and does not restrict "put into play" effects (see Limited in the rulebook). The answer is yes. You can't marshal or play more than 1 limited card per turn, but "put into play" is different to these things. Put into play is different from play??? 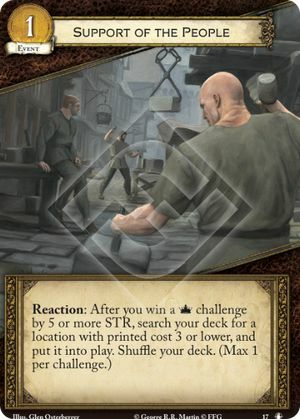 In the Marshaling phase, the active player can (as a player action) marshal a character, location, or attachment card (or a duplicate) from his or her hand by paying that card’s gold cost and placing the card in his or her play area. A player pays a gold cost by returning the indicated amount of gold from his or her gold pool to the treasury. When a card is marshaled, it is considered to have entered play. Event cards are not marshaled, they are played. Card abilities that put a card directly into play are not considered to be marshaling the card. Some card abilities may cause a card to be “put into play.” Such abilities place the card directly into play from an out of play state. The gold cost of the card being “put into play” is not paid. Unless otherwise instructed by the “put into play” effect, cards that enter play in this manner must do so in a play area or attachment state that satisfies the rules of marshaling the card. If an additional copy of a unique card a player already owns and controls is put into play under his or her control, it enters play as a duplicate. (or played, if the card is an event) by each player each round. No more than 1 limited card can be placed by each player during setup. Limited cards that are “put into play” via card effects ignore and are ignored by this restriction.